Managers in one pharmaceutical production are facing daily with problems such as huge number of paper documents, some of them still partially raw, colleagues constantly asking: “What we need to make further?”. Not forgetting the constant discussions with the sales department of the products that are urgently needed “overnight”. There are more favorable scenarios: the staff is equipped with terminals and can be consulted on the following activities each working place at any time, operators perform appropriate activities as assigned. Finally, complete electronic documentation and records of the operations and status of production and packing facilities are available at the touch of a button. Software solutions for operational management (Manufacturing Operations Management – MOM) is at the heart of such scenarios. MOM4 monitor, optimize and document the business processes performed by industry in full compliance with all pharmaceutical requirements. 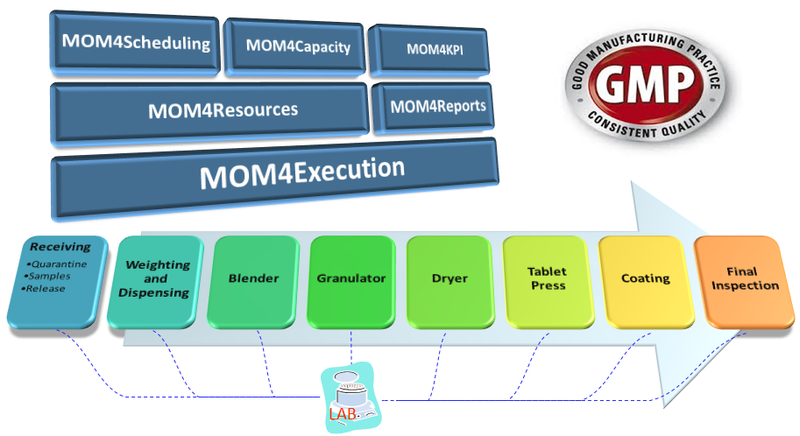 MOM4 is the purpose of enhancing the safety and reliability of the production process and improve product quality. MOM4 is suitable for various processes, including chemical or biochemical production of active pharmaceutical ingredients (APIs), and post-processing of such APIs in solid and liquid dosage forms.